Tina Fey, comedic star who as won awards for her work as both a writer and performer, has recently appeared on "The Late Show with David Letterman" and "The Oprah Winfrey Show." With the recent release of her new book, Bossypants, she's in the news now more than ever. But what young people may not know is that in addition to entertaining millions, Fey has made a difference in people's personal lives. For grades 6–up our biography, Tina Fey: TV Comedy Superstar is a great way for students to learn more about this fascinating star. Has anyone been to The Walt Disney Family Museum in San Francisco? From the descriptions on the web site, it sounds like a fun and interesting place. The last time I was in San Francisco (which was several years ago) they were renovating the buildings in the Presidio that contain the museum. One of my brothers lives in San Francisco and drove through the Presidio to show me the buildings. The views from that area are simply spectacular! Enslow's Walt Disney title is for middle school readers. It's simply amazing what this man, with the help of his brother, was able to create. Dedicated to educating the public about cancer as well as raising money for research, Lance Armstrong has beaten the odds against his own battle with cancer. Elementary readers will enjoy learning about Lance in this 48 page book. For middle school readers, this 128 page book will explain Armstrong's Foundation and his "LiveStrong" yellow wristbands. One of the most visible and recognizable men in America today, Dr. Phillip C. McGraw is a best-selling author, life coach, and the star of "The Dr. Phil Show." Dr. Phil was not always wealthy and successful. His experiences as a child and young adult taught him that setting firm goals and working hard would eventually result in the life he wanted. Dr. Phil's combination of psychotherapy, folksy humor and common sense advice continue to make him one of America’s most popular celebrities. Enslow Publishers has two titles for your middle school/high school student on Ms. Rowling. The first, written for the middle school student, is an unauthorized biography. The second, geared toward the high school student, discusses censorship, and the Harry Potter books in particular. Arnold Schwarzenegger was only fifteen years old when he made up his mind: "I wanted to do something special," he said, "to be recognized as the best." Schwarzenegger set his sights on becoming the top bodybuilder in the world, and after that—a rich and famous movie star. He never doubted his ability to reach his goals. In 2003, the popular action hero aimed his ambition and energy in another direction: politics. As governor of the richest and most populous state in the country, Schwarzenegger has faced his biggest challenges yet. Before Donald Trump entered the world of television with his hit reality show, The Apprentice, he made a name for himself as a hard-driving real estate developer in New York City. From there he expanded his property interests to include casinos in Atlantic City and top-notch golf courses around the country. He has published a number of books about his life and insights on business, many of which have become best-sellers. This biography explores the successes, as well as the difficulties of Mr. Trump's life, as it introduces young adults to this interesting and controversial personality. Dorothea Lange was an influential American photographer and photojournalist. Lange is best known for her Depression-era work, which gave a face to the widespread human suffering that was taking place across the country at that time. Lange's work during this period, in addition to her later work, would profoundly influence the development of documentary photography. Bono is lead singer of the internationally acclaimed rock band, U2. In addition to his fame as a rock superstar, Bono has also became widely known for his activism in recent years and has even been a candidate for the Nobel Peace Prize. Today Bono stands as a shining example of a superstar who gives back in the hopes of making our world a better place. 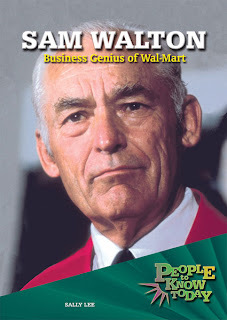 Sam Walton was the founder of the tremendously successful retail chain, Wal-Mart. In addition to his business accomplishments, Walton supported various charitable causes, including those of his church, the Presbyterian Church. The Sam and Helen R. Walton Award was created in 1991 when the Waltons made a gift of six million dollars which included an endowment in the amount of three million dollars to provide annual awards to new church developments that are working in creative ways to share the Christian faith in local communities. Today would have been Robert Frost's birthday. You can also learn more about him here.